World Cup 2014: Is Memo a ‘Savior’ or Just Lucky? Only in fútbol can 90+ minutes result in a 0-0 draw and be sincerely described as phenomenal. But that’s exactly what soccer fans were treated to during Tuesday’s World Cup match between Mexico and Brazil in Fortaleza. In one of the most anticipated match-ups of the 2014 World Cup — the earliest of which occurred on Monday when Germany beat Ballon d’Or and Golden Shoe winner Cristiano Ronaldo and his Portuguese teammates in a 4-0 rout — Mexico not only kept the quadrennial favorites scoreless, El Tri even managed to outplay the Brazilians for much of the second half, imitating the host nation’s iconic style of smooth passing and aggressive play. On paper La Canarinha dominated as usual, controlling the ball and nearly tripling Mexico’s number of shots on goal. But only one stat truly tells the story of the game: the number of saves. The Brazilian side grew increasingly tormented once Memo’s goalkeeping seemed impenetrable, while the Mexicans only grew more enlivened. The only guys in canary yellow who kept their cool were the two star 22-year-olds, Neymar and Oscar. Fred, Brazil’s veteran forward, never really showed up. As a team hosting the tournament and heavily favored to win it, Brazil’s 0-0 draw against a team that’s not even in the top 15 feels like a shocking loss, since the Seleção was expected to breeze through the group round. Brazil might still end up winning Group A by beating Cameroon and watching Mexico either draw or go down against Croatia, which isn’t all that unlikely. Nonetheless, that Brazil won’t be leaving the first round of matches with three straight wins like they were expected to has plenty of people worried about the host nation’s performance in the later rounds. On the other hand, as a team known for its inconsistency and disappointing showings in previous World Cups, Mexico’s fans are celebrating the 0-0 draw against Brazil like a crushing victory. Yet it was Memo’s incredible goalkeeping that was the lone highlight of Mexico’s gameplay, not anything done by Mexico’s forward lines. Mexico only had three shots on goal, compared to Brazil’s eight. And El Tri was never caught offsides, which means one of three things: Mexico timed all of their breaking passes perfectly, at least one Mexican player was offsides but the ref never called it, or Mexico wasn’t pushing the ball forward enough. Considering they rarely threatened Brazilian goalkeeper Júlio César with shots on goal, it’s a pretty safe bet that the third explanation is closest to the truth. 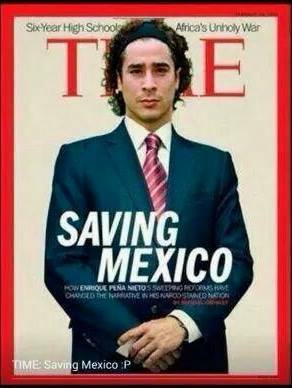 Plus it could be that Ochoa gave an extraordinary performance, or that he just got lucky. Sure, soccer is a game based on a ton of skill, but there’s also plenty of luck involved as well. One fortuitous bounce left or right, up or down, is all it takes to shift the momentum of a single match, a string of which can determine the outcome an entire tournament. Darijo Srna and the Croatians might beat Cameroon on Wednesday and get a couple past Memo during the match on Monday, June 23. Should that happen (Croatia did place third in the 1998 World Cup), and should Brazil beat Cameroon (like they’re supposed to), Mexico would have to book an early flight back home. In the end, all of Mexico’s World Cup hopes rest on Memo’s ability to do again what he did on Tuesday.